Now isn't this a very yummy cover? 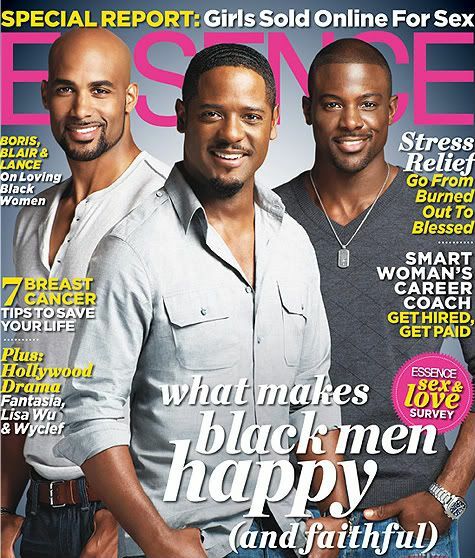 Blair Undwerwood, Boris Kodjoe, and Lance Gross cover the October issue of Essence Magazine and their dishing on why they love black women. Yes ladies you read that last line correctly. Despite what the media may have you to believe there are actually black men out there who love you. Does Blair Underwood even age? I swear that man gets finer the older he gets. That is some major eye candy!! Yeah, yummy, yummy, yummy and some mo' yummy. Blair Underwood isn't aging. He's amazing. Just in case your intersted, here's a link to the video the photographer did for his Jet cover. He's fine and seems like alot of fun. I won't even comment on Boris. No words for that level of fineness.